Sweet baby Yeezus, that’s a Kanye Bat Signal if ever there was one. And sure enough, Kanye, donning one of his baddest-assed tour T-shirts, wasn’t far behind. “Sources say Kanye and Kim rushed into the waiting room of chiropractor Richard Hill and found the 18-year-old sitting there,” TMZ writes. 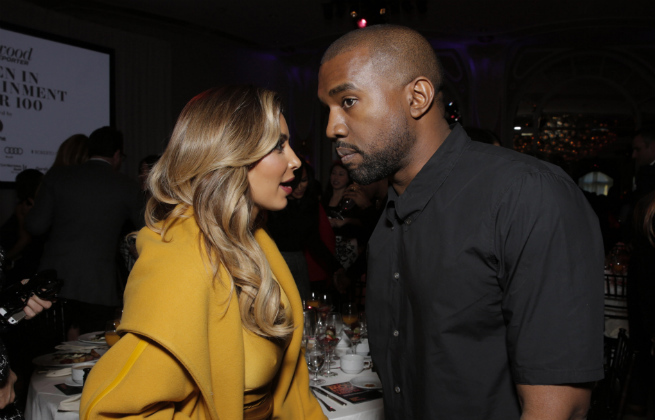 “Witnesses say Kanye punched the guy and Kim screamed, ‘We have it all on tape. '” (Huh?) People’s source says Kanye “barely” hit the guy, which is either a comment on ‘Ye’s restraint or his weak right hook. The he-said/she-said ends there, though: A police statement confirms that Kanye was identified by numerous witnesses and that he left the scene before officers arrived. Now Yeezy’s a suspect for misdemeanor battery, and he still hasn’t even wrapped up the whole LAX assault situation with that photographer from last summer. While Kanye’s storied paparazzi duels have left him essentially legally unscathed, the justice system might treat things a little differently when the victim is a non-photographer private person, no matter how much hate speech he was spewing. We’ll see.